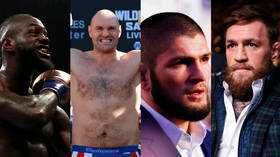 New year tradition usually dictates ‘out with the old and in with the new’ but, in the fight game, 2019 could be a case of continuing past rivalries to settle old scores with a host of mouth-watering potential rematches. In 2018 we were treated to a host of scintillating action across the combat sports world and, if we're lucky, those KO punches, take-downs, knockdowns and roundhouses could be repeated this year also. RT Sport lists the three most anticipated fight rematches that could take place in 2019. Two of boxing’s biggest big men, Tyson Fury and Deontay Wilder gave us a heavyweight barnstormer for the ages to cap a year of top-class pugilistic entertainment for American Wilder’s WBC strap in LA. Fury, returning to the ring after a three-year layoff from elite competition, displayed no hint of ring rust in dominating KO King Wilder throughout most of the rounds, but The Bronze Bomber neutralized the Manchester man’s slickness with two devastating knockdowns in the ninth and twelfth, the second of which prompted a back-from-the-dead rise from the canvas akin to WWE superstar The Undertaker. Fury saw out the fight and the judges scored a controversial split draw, allowing both fighters to keep their undefeated records. Following the fight, many observers believed the pair had proved themselves the top two fighters in boxing’s glamor division, eclipsing WBO, IBF and WBA champ Anthony Joshua in notoriety and leapfrogging the Briton up the pecking order in relevance. Promoter for ‘The Gypsy King’, Frank Warren, said on Friday he was “confident” a rematch would take place in the early part of 2019 in a yet-to-be-named venue in the US, whereas trainer Ben Davison said he would like any return to take place in the UK. "We're trying to make that fight at the moment, everyone wants the fight and most importantly the fighters want it," Warren told ESPN. "The venue is looking like the U.S., that's where the money is. Tyson was disappointed with the judging with the last fight, as I was, so a lot of things need to be sorted but the U.S. is where they want it, probably in the second quarter. Vegas has been named as one potential options should the fight take place stateside, with Manchester Arena and Wembley Stadium in London possible UK venues. Wherever the rematch will take place, if the action is half-as-good as the first installment, we’ll be in for a violent treat in 2019. However, Joshua and Wilder have expressed interest in fighting each other, with both perhaps eager to avoid the slippery Fury and meet in a unification fight, which could prove a significant roadblock to proceedings. The Jon Jones-Daniel Cormier saga is one of the most spiteful and murky rivalries in combat sports, dating back four years to their first fight in January 2015, which Jones won by decision in Vegas to defend his UFC light-heavyweight crown. Since then, a tale of trash talking, failed drug tests, and overturned rematches has unfolded between the UFC top two pound-for-pound ranked fighters. After the fight Jones was stripped of his title for violating the organization’s Athlete Code of Conduct policy, after being arrested “on a felony charge of leaving the scene of an accident involving personal injury” and also being in charge of marijuana. Eventually, a rematch took place at UFC 214 in California, where Jones was declared the winner again by third-round stoppage, only for the result to be annulled and declared a draw after Jones tested positive for banned substance turinabol, forcing him out of the ring until October 28. Ahead of his return at the tail end of last year, further complications arose when Jones failed yet another test on December 23 and the entire UFC 232 card was subsequently moved to Inglewood, California, after Jones was denied a license to fight in Vegas. Despite the initial roadblock, Jones managed to TKO Alexander Gustafsson in round 3 and return to his previous elite status after an enforced year-and-a-half layoff. In that time, Cormier, who was given his light-heavyweight title back after the overturned rematch result and defended and relinquished the belt, then moved up and captured the UFC heavyweight title, making the two rivals stars of the top two divisions. Surely a rematch must happen between the two giants at the top of not only their own tree, but that of the entire promotion. MMA Junkie recently ran a poll of which rematch their readers would like to see most, and the two big men ran out winners, with 44% of the vote. Today’s #DailyDebate question for @MMAjunkieRadio: You can only pick one rematch to see this year. What is it? Jones has already issued a challenge to Cormier at light-heavyweight, speaking at his press conference after his win over Gustafsson. So come on Dana, put pen to paper, set a date, and let’s pray that Jones can keep his proverbial nose clean, at least until then. The biggest fight in MMA history sent shock waves through the fight world as stony-faced Russian Khabib Nurmagomedov submitted cocksure Irishman in four rounds in Las Vegas to retain his UFC lightweight title and cement his place among the sport's elite at UFC 229. Since then, rumors have surfaced over Dagestan native Khabib wanting to mimic McGregor's move into boxing and take on Floyd Mayweather Jr. in a crossover bout, to which the American has conditionally agreed. McGregor has rebuffed challenges from Max Holloway and Japanese kickboxer Tenshin Nasukawa, who was dismantled by Mayweather in one round in Japan on New Year's Eve. A host of other names have been mentioned and a clutch of fighters have thrown their hats into the proverbial ring to challenge the hottest champion in the promotion, all, it would have to be presumed, behind former champion Tony Ferguson. But, the fight every MMA fan will want to see is surely a return between two men who endured a vicious buildup that proved every bit as brutal as the punishing minutes they shared in the octagon. And the two still remain suspended by the Nevada State Athletic Committee following their equally savage post-fight brawl. Khabib's father and trainer Abdulmanap said his team had been offered $15 million dollars for a rematch, but that he and his son were looking for twice that amount. UFC boss Dana White said that a rematch "should happen" in 2019 and McGregor posted on Instagram that he himself was looking forward to a rematch, although Khabib's camp have been a little less forthcoming, insisting other, more lucrative options would be better suited to extending the fighter's "legacy". Another instalment of the Nurmagomedov-McGregor legacy would certainly be much more welcome among fight fans.